​A documentary about indigenous music bands in Oaxaca, Mexico. People of earth and clouds is a documentary that grew out of an increasing frustration with the precarious and corrupt socio-political situation that reigns Mexico. Yet rather than documenting or criticizing the conflict directly, the aim of the project is to take inspiration from other existing realities in Mexico, where indigenous communities have, through autonomous organization and the protection of their traditional communal life styles, managed to keep the waves of violence out of their communities. The film explores the way in which the wind bands in the Zapoteco region are closely tied into the communal life and within the cultural mechanisms of the villages. Moreover it aims at demonstrating how the musical traditions of the wind bands form and sustain connections and endorse peaceful coexistence between different Zapoteco villages and amongst the different indigenous, such as the Mixe and Chinanteco ethnic groups of the Sierra Juarez. San Pedro Cajonos, Oaxaca, Mexico. The site of the documentary is the Sierra Juárez, located in Oaxaca State, considered one of the poorest in Mexico. Oaxaca is home to Zapoteco, Mixe and Chinanteco indigenous groups. San Pedro Cajonos functioned as our main filming base while we moved around other villages of region during the production. Davis Project for Pace is award that every year finances students' initiatives to promote pace around the world through socially engaged projects with the aim of promoting innovation and entrepreneurship focusing on conflict prevention, resolution or reconciliation. Fortunately, People of Earth and Clouds was in 2015 one of the financed projects, and it was thanks to this generous support that the first part of the production process was successfully finished. We hope that our project will help to change the general idea that indigenous communities in Mexico need intervention from outside in order to “improve” they living conditions. Yet, on the contrary, the truth is that they urge policies that support their own way of organisation and respects their political functioning, which in many ways differs from the political system officially used by the Mexican state. Secondly, we look forward to going back to present the documentary in the villages in which we worked and filmed the footage for the film. Since this is an independent project and its goal has never been to obtain a personal economic benefit out of it, we totally depend on our own means to distribute and promote this project. 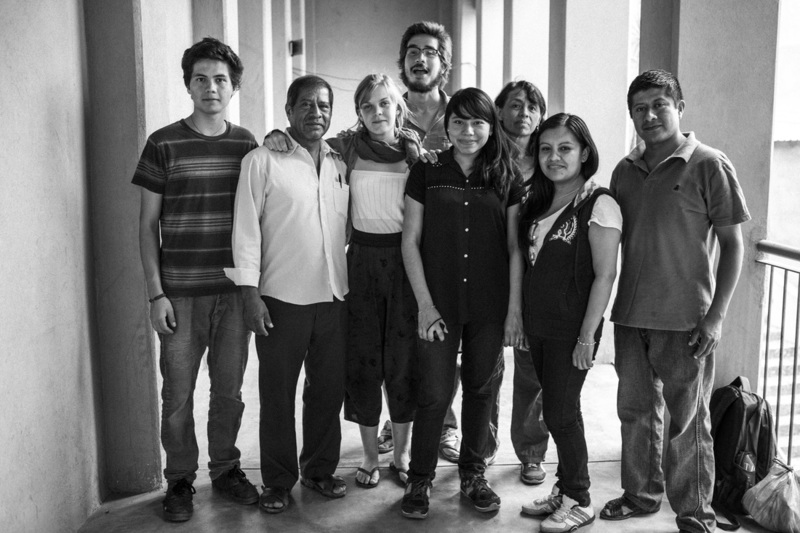 Therefore, if you agree with the ideals of this project and would like to help us spread the word or support us economically or practically, please get in contact with us, we are open to suggestions and new collaborators that help us improve our work and the impact it will have in benefit of the people from Oaxaca. Last day of shooting in Yalalag, Oaxaca. This documentary is our way to promote respect and admiration for these initiatives that have evidently sowed a positive impact in these communities and which are worthy of being recognized and promoted outside the region and even the country.